Talk about a pleasant surprise on this Monday afternoon – the Nexus 6, Google’s new flagship phone that has been quite hard to acquire, is now available from US Cellular. 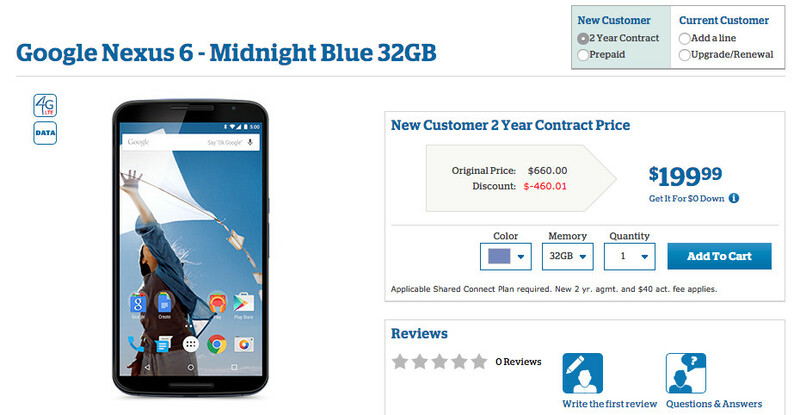 In an even more surprising move, US Cellular seems to not only be selling the Midnight Blue model, but the Cloud White model as well, something no one else is doing outside of Motorola and Google Play. If you are ready to attach yourself to two years of US Cellular service, you can order the Nexus 6 today for $199 (32GB) or $249 (64GB) on-contract. If you would like to avoid the contract, you can go “prepaid” and buy it outright for $660 (32GB) or $730 (64GB). But the question then becomes – is this phone unlocked and will it work on other carriers? That, we don’t know, unfortunately. AT&T managed to SIM lock their unit, but T-Mobile and Sprint left theirs open, just like the versions sold directly from Motorola or Google Play. US Cellular is a CDMA carrier, so things could potentially be a bit tricky. It’s tough to know without one in hand. Oh, and yes, Verizon is the last remaining US carrier without the new Nexus.